Our TYGER (Temple Youth Group Etz Rimon) is for students in high school, grades 9 through 12. Junior TYGER is for middle school students in grades 6 through 8. 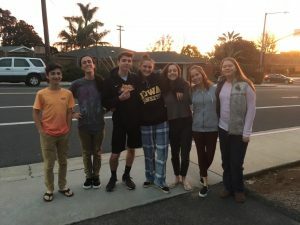 Under the direction and guidance of our youth advisor, the groups develop friendships, improve leadership and communication skills, and grow into the natural expression of who they are, within a nurturing and safe Jewish environment. TYGER Youth enjoy fun and exciting opportunities to participate in tikkun olam, social action, and social events. TYGER members also participate in NFTY (North American Federation of Temple Youth). It’s never too late to join in the fun. If you are not yet a member, contact the temple office at info@templeetzrimon.org and send in your completed TYGER Registration Form.